This Craftsman new build was oriented to overlook the Rockies in Springbank. The seamless craftsman feel throughout was created with carefully selected and beautifully custom designed and manufactured products specifically for this home. Bespoke furnishings and soft goods reinforce a comfortable, classic craftsman look and feel. Bespoke items by Patricia Conner Designs. This large kitchen with a double, stainless farmhouse sink and island prep sink is a functional and beautiful space. The hood fan, detailed in black metal and white bronze, is flanked by custom cherry, shaker cabinets. Soapstone counter tops play against the granite on the huge island. The tile is designed and handcrafted especially for this space. The kitchen boasts a coffee bar and a dumb waiter which makes easy work of transporting groceries from the underground garage. This bespoke hood fan was created to integrate seamlessly with the shaker cherry cabinets. The addition of black metal and white bronze reinforces the craftsman aesthetic and works with the bronze Rocky Mountain hardware. An intricate, handcrafted, ceramic tile back-splash was designed and created especially for this space above the 48″ Wolf range. 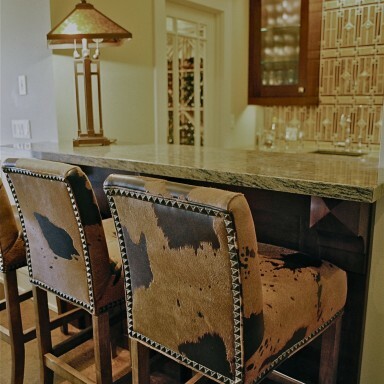 Bespoke hide bar stools with nail head detail work perfectly in this play space. 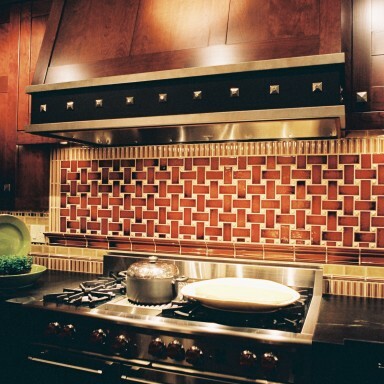 The craftsman style handcrafted back-splash tile is a great focal point that is flanked by custom cherry cabinets. 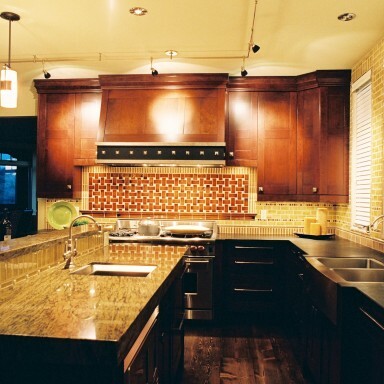 A custom wine storage room was created to the owner’s specifications to house his favorite wine. The lighting is by Hubbarton Forge and Fine Art Lamps.